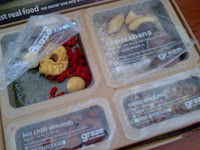 Before I get to that ‘but’, for anyone who has never heard of Graze, go and take a look now. Graze describes itself as ‘healthy eating by post’. I describe it as yummy. 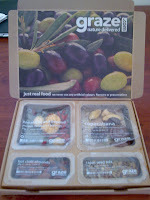 Each week my graze box arrives through the door. Four little pockets of yummy goodness, from olives to nuts, to sultanas, to fruit. No artificial colourings, flavourings, or preservatives. The idea is that by quietly grazing on natural foods that release their energy slowly, the body’s blood sugar levels are kept at a more constant and stable level, rather than the see-saw effect that eating one big lunch of processed foods has. This is better for my body, better for my energy levels, and better for my ability to concentrate on whatever task I have in hand. It stops me from running after that chocolate bar for a late afternoon boost. This can only be a good thing. But – yes, here is the but – the little pockets that hold all this tasty goodness are, you guessed it, plastic. As plastic goes, it’s quite a good kind of plastic, though. At least, that’s what one side of my brain is telling me – the other side is yelling at me that there is no such thing as good plastic. And this is something that I’ve been struggling with quite a lot recently: where is that line between what is acceptable and what isn’t? The plastic in the Graze boxes is 80% recycled, and they claim it can be recycled again. I have been washing out the little tubs and putting them out for the weekly recycling collection, but do they actually get recycled at the other end or do they wind up in the reject pile? Saying they can be recycled doesn’t necessarily mean they will be. But I also feel that it’s good to support companies that have such careful and ethical packaging policies – and Graze really are trying, it’s just that they still have to work within the copious food hygiene laws and restrictions. The plastic pockets are housed in a plain cardboard box which is made from sustainable forests and is completely biodegradable and recyclable. There’s no fancy artwork or clever gimmicks; what you see is what you get, and there is something inherently beautiful in that. But plastic is plastic and this experiment is supposed to be about living without plastic, not talking myself into it, or into ‘good’ kinds of plastic. Perhaps the real question is, do I really need Graze? I survived without it before so I’m sure I can do again. I just have to persuade my fingers to click on that little ‘cancel delivery’ button.